“…once one is reduced back to fivers and coins, the city feels very different all over again. One moves from a post-pay to a pre-pay world, in which anonymity is won at the expense of convenience, something the government is convinced ‘the public’ don’t want (William Heath has queried this repeatedly). It is a pain in the arse in many respects, but you do also get that bizarre, slightly retro feeling of being able to wander off into a crowd and be anyone you want, like the first time you go to the shops on your own to spend your pocket money. The flaneur, for instance, would surely have to use real pounds and pence (alright, francs and centimes) rather than an Oyster card or Visa. There is something rather wonderful about cash, in that if money talks, then nothing else has to. I’ve done this a couple of times myself, both intentionally and unintentionally. It makes for a different flow of time, and thoughts than you have when instantly connectable to your bank account or your friends. Further thoughts on the art of disconnecting from Rajat at Rootburn. The future is unknowable because it depends on people and because people reflect, have will, make mistakes, co-operate and change their minds and ways. The past turns into one of many possible futures through human agency. The way to understand what is happening in the world is not to draw trajectories on paper but to ask what people are thinking and doing in their own lives and collective endeavours. I think is what most teams that think about ‘futures’ for a living do, however. The outputs of processes such as scenario planning explicitly create ‘many possible futures’ as navigational aids, not pre-plotted courses to be slavishly followed. I’m not sure you can call it "Virtual Earth", originally uploaded by blackbeltjones. If this is what you get when you search for London. I love that there are places called “Sublimity City” and “Deer Lick” neighbouring the great metropolis. I’ve mailed gmail support already, before you ask. Apollo 11 landing, originally uploaded by Kevin Marks. 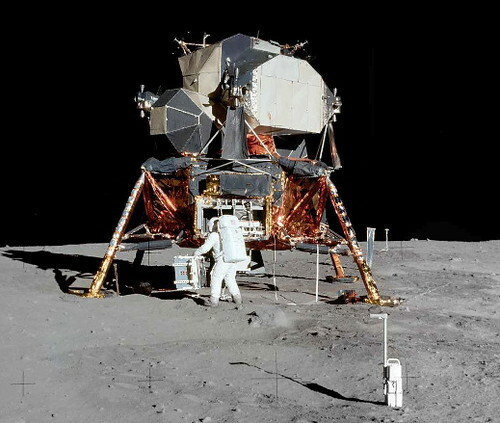 Apollo 11 landed at Tranquilty on this day 36 years ago. Moon.google.com commemorates it nicely.